REGIONAL NEWS - LATIN AMERICA 18 E&MJ • APRIL 2018 www.e-mj.com sion internally and looks forward to the im- mediate advancement of these initiatives to deliver the attractive growth profile that this optimized LOM plan envisages." The plan considers mining 43 million metric tons (mt) of ore grading 2.87 g/mt gold. Total recovered gold production over a 16-year mine life is estimated at 3.8 million oz. Production is expected to peak in 2022 at 313,000 oz. Of the 3.8 million oz recovered over the LOM, 1.7 million oz are sourced from open-pit operations and 2.1 million oz are sourced from underground. The open pit has a mine life of 13 years based on 19 million mt of ore mined at an average grade of 2.74 g/ mt. Approximately 55% of the ore will be sourced from Rory's Knoll and 30% from Aleck Hill. The remainder will be sourced from the Walcott Hill, Mad Kiss and North Aleck Hill satellite deposits. Mining activ- ity over the near term will be focused on fresh-rock ore at Rory's Knoll. Following a two-year preproduction period, underground mining at Rory's Knoll is expected to be fully ramped up in 2022. Longhole open stoping will initial- ly target higher-grade material below the bottom of the pit. In 2023, the crown pil- lar will be blasted, and mining will transi- tion to sublevel caving for the remainder of the mine life at an estimated average mining rate of 4,700 mt/d. An improved mine schedule is expect- ed to provide supplemental feed from satellite deposits later in the mine life. Accelerating underground development is also expected to provide an ideal platform to potentially upgrade and expand the underground resource, especially at East Walcott, where limited historical drilling has produced exceptional results. Initial underground mine development will be conducted primarily by contract mining. An extensive training and develop- ment program will allow the transition to a company underground workforce of ap- proximately 80% Guyanese nationals over the life of the underground operations. The existing process circuit has a ca- pacity for 5,600 mt/d. The proposed ex- pansion to 7,500 mt/d will be completed in two phases. The first phase is nearing completion and is expected to increase the hard-rock throughput rate from 5,600 to 6,600 mt/d. This phase consists of de- bottlenecking the back end of the circuit and includes the addition of three leach tanks, a pre-leach thickener, carbon man- agement systems, and expansion of the elution circuit. Due to additional reten- tion time within the leaching circuit, the phase one project is expected to increase recoveries by approximately 1% to an es- timated average recovery of 92.5%. The second phase of the expansion will allow the continued processing of 7,500 mt/d of hard-rock ore and is slated for completion by the end of the fourth quarter of 2018. 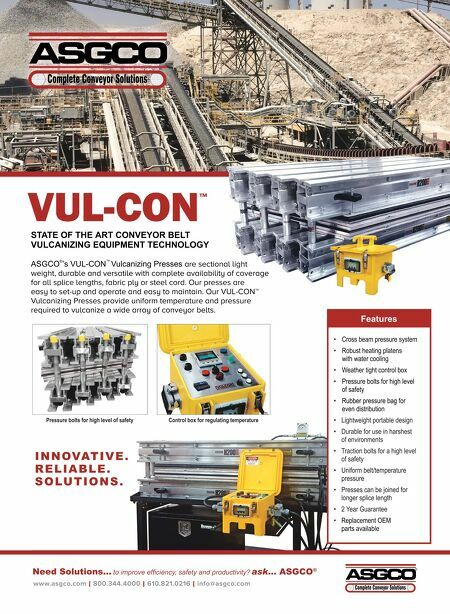 It includes utilization of a pre-crushing circuit and ball mill from a previously purchased 1,000-mt/d modu- lar processing plant. Once completed, the company expects overall gold recovery to significantly increase to approximately 95%. In addition, a significant increase in gravity recoveries results in lower over- all reagent consumption. Guyana Gold has awarded the engi- neering and procurement contract for the phase two mill expansion to JDS Mining. Wealth Enters Strategic Alliance With ENAMI for Chilean Salars Wealth Minerals has entered into an agreement with the state-owned Nation- al Mining Co. of Chile (ENAMI) to form a strategic alliance to develop and commer- cialize the company's projects in the Sal- ar de Atacama and Laguna Verde. The two will have 24 months to study and assess the properties and to form a joint-venture partnership for the exploration, develop- ment and mining, and for marketing the products, the company said. 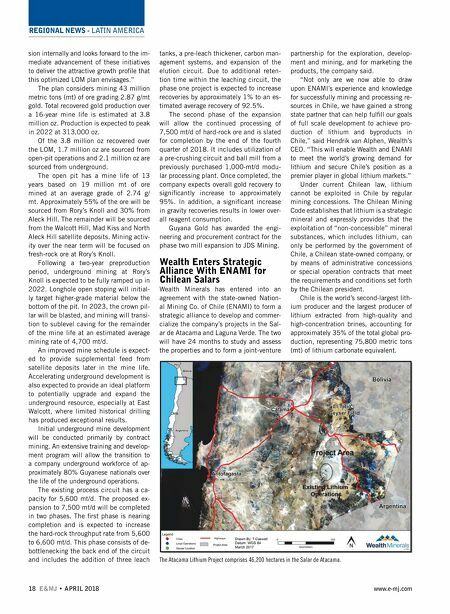 "Not only are we now able to draw upon ENAMI's experience and knowledge for successfully mining and processing re- sources in Chile, we have gained a strong state partner that can help fulfill our goals of full scale development to achieve pro- duction of lithium and byproducts in Chile," said Hendrik van Alphen, Wealth's CEO. "This will enable Wealth and ENAMI to meet the world's growing demand for lithium and secure Chile's position as a premier player in global lithium markets." Under current Chilean law, lithium cannot be exploited in Chile by regular mining concessions. The Chilean Mining Code establishes that lithium is a strategic mineral and expressly provides that the exploitation of "non-concessible" mineral substances, which includes lithium, can only be performed by the government of Chile, a Chilean state-owned company, or by means of administrative concessions or special operation contracts that meet the requirements and conditions set forth by the Chilean president. Chile is the world's second-largest lith- ium producer and the largest producer of lithium extracted from high-quality and high-concentration brines, accounting for approximately 35% of the total global pro- duction, representing 75,800 metric tons (mt) of lithium carbonate equivalent. The Atacama Lithium Project comprises 46,200 hectares in the Salar de Atacama.